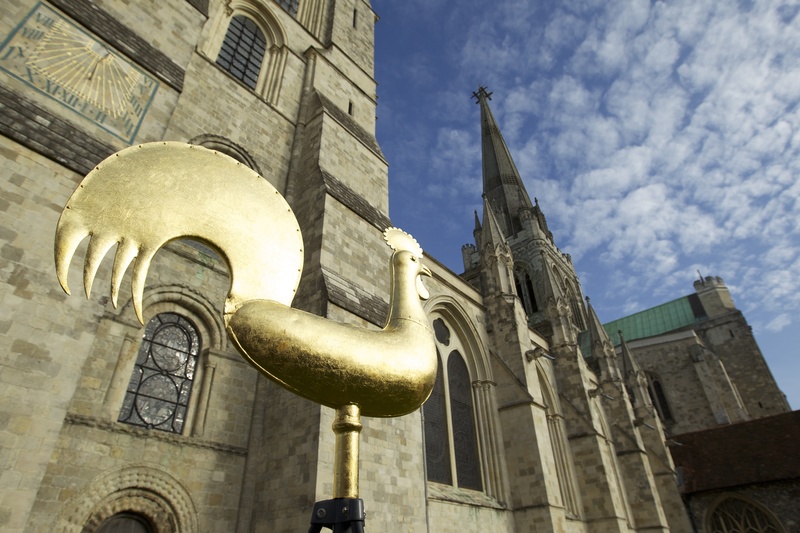 On Wednesday 2nd November a team of steeplejacks will install an extremely special weathervane on the top of Chichester Cathedral’s 277ft Spire. Newly gilded in Fairtrade and Fairmined Gold, this unique weathervane is the result of a pioneering collaboration between Chichester Cathedral, Chichester-based ethical jewellers Cred and the Fairtrade Foundation. When the gilded weathervane is positioned on top of the Cathedral Spire – it will be the first time ever that Fairtrade and Fairmined Gold has been displayed on a public building. The gold covering the weathervane was responsibly sourced by Chichester’s Cred jewellers from the Sotrami Mine in Peru – one of the first mines in the world to be certified to Fairtrade standards. Both the Sotrami Mine and Cred are part of a new – and revolutionary – programme of Fairtrade and Fairmined Certified Gold launched on Valentine’s Day earlier this year. Fairtrade and Fairmined Gold is the world’s first independent ethical certification system for gold. The certification enables businesses, from designers and retailers to fabricators and distributors, to offer their customers the guarantee of a product which has been responsibly mined. Crucially, this means that small scale miners receive a fair price for gold, ensuring a more stable future for them and their communities. The gilded Cathedral weathervane – a 3ft cockerel – will be installed at the top of the Cathedral Spire on the 2nd November. (Press and Media representatives are invited – see details below). A team of steeplejacks will climb 131ft – 205 steps – to reach the base of the Spire and then ascend a narrow 146ft ladder directly up the side of the Spire, arriving finally at a tiny scaffold platform erected especially for this project around the Spire Cap. Chichester’s Cred jewellers have been pivotal to the realisation of Fairtrade and Fairmined Gold and were one of the first ethical jewellers in the UK to produce collections sourced in this way. Prior to the gilding of the weathervane, the gold was sent to Italy to be turned into gold leaf. The Italian company Manetti is one of Florence’s oldest companies and the only remaining organisation in Europe who are able to turn gold into gold leaf. The leaf needed to gild the weathervane is just 8 microns thick (1 micron is 1000th of a millimetre) and is made out of 23 ½ carat gold. The gold started life as a pure 24 carat but the leafing process introduces a small amount of copper. 1. Press and media enquiries welcome. Interviews and images available. 10.30 onwards opportunity to film/photograph the weathervane at ground level. 11.30 weathervane blessing and opportunity to meet/interview representatives from the Cathedral, the Fairtrade Foundation, Cred Jewellers and Manetti. 12 noon onwards opportunity to film/photograph the steeplejacks install the weathervane at the top of the Spire. 3. The Fairtrade Foundation is an independent certification body which licenses use of the FAIRTRADE Mark on products which meet international Fairtrade standards. Its vision is of a world in which justice and sustainable development are at the heart of trade structures and practices so that everyone, through their work, can maintain a decent and dignified livelihood and develop their full potential. The Fairtrade and Fairmined system means miners will receive a set Fairtrade minimum price for their gold, plus a Fairtrade premium to invest in community and business development projects, these include better working conditions, education, health and environmental restoration. To date, three miners’ organisations, representing 2,500 miners and their families are being certified under the Fairtrade and Fairmined standards. Great post. Thanks for sharing this exciting development, I find it interesting how the UK churches have fully embraced the Fairtrade culture and message.